Despite the fact that I’m all about making things from scratch, growing what I can and DIYing, I am actually obsessed with efficiency. If I maximize my time, I can make even more things from scratch, right!? Sitting idle while R has activities or classes is my number one struggle in homeschooling. Up until I had little E climbing all over me, I could at least knit to be productive. Now that he’s obsessed with tearing apart my knitting bag, it’s useless. I’m tempted to pack a bag of apples and a peeler for the next event I’m spectator to. If only I could bring a weedy garden bed! This is why I love my method of making apple sauce, and I’m excited to share it with all you busy readers who value homemade. I am always looking to shave time of processes, but if it’s a September task, I especially need to cut to the meat and bones. September is that glorious intersection of the gardening seasons – when all the Summer garden bounty is still needing to be harvested and processed (tomatoes, eggplant, summer squashes, beans and more!) AND the Fall garden bounty starts rolling in (I’m currently cross-eyed with pears and apples). I love canning, making salsa, fermenting, pickling, but some days I feel a bit panicked as I set out with square shoulders to attend a homeschool activity, walk past the bucket of tomatoes, remember the engorged eggplants I keep meaning to harvest, and find yet another rotted pear that I wish I had gotten to sooner (why oh why do they ripen so fast?!). Ahhh, it’s the September busy! 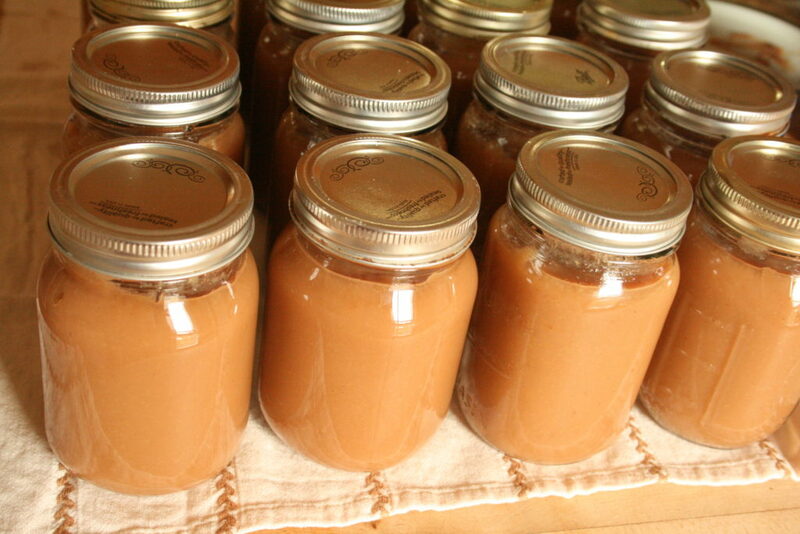 In this vein, I present to you my no-frills, gotta-keep-going method for putting up our year supply of applesauce. It comes little taste-tester approved as my kids can’t get enough! I’m not a gadget hound, but if there’s one piece of kitchen equiptment I think is not replaceable, its a high-powered blender. I know, I know, the Vitamix is spendy. Trust me, it makes up for it with the health of your family. It makes kale in those smoothies and popsicles unrecognizable. It makes the worlds easiest and freshest sauces and dressings – I don’t even need to cut those hot peppers, garlic and ginger before whizzing them with some peanut butter and pouring that smooth goodness all over our stir fry. Creamy root veggie soup anyone? Ok, I could go on and on. 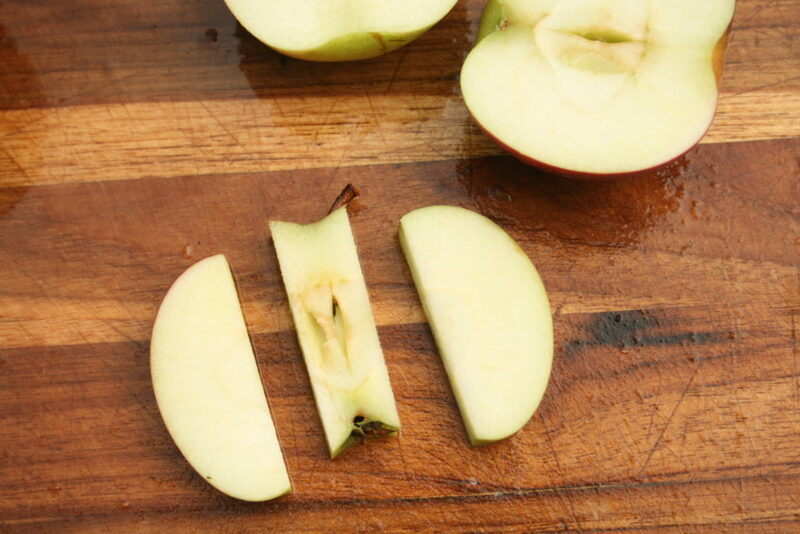 I’m not a fan of the apple slicing tool as the cores in homegrown apples are often not in the center. I find it to be easier, and for there to be far less waste, if I make four quick cuts as shown below. 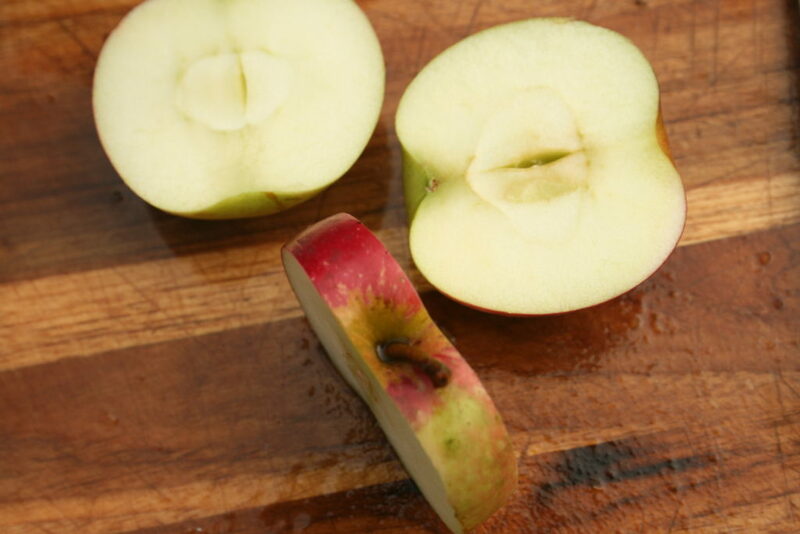 Some people keep sliced apples in a bowl of water with ascorbic acid or lemon juice to prevent browning. I find I don’t have to do this to have normal looking and great tasting sauce, so I skip that. 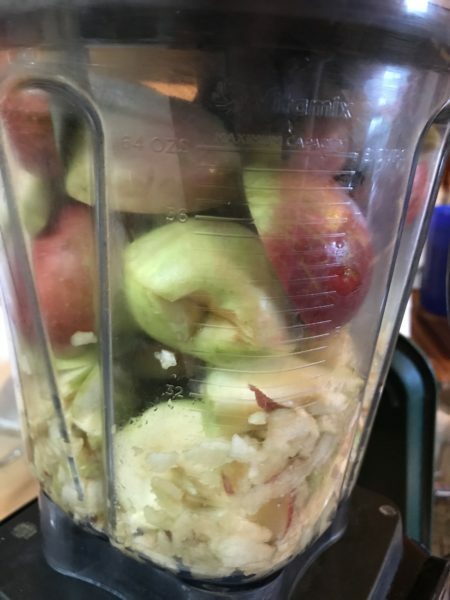 Fill the pitcher of your blender with the cut apples from above. I did not have to cut them into smaller pieces; the Vitamix is a powerhouse like that! These apples were not the juiciest (probably because I waited a while after harvesting before getting to this project). If that’s the case for you, too, you can add a dash of unsweetened apple juice prior to blending. Not a lot, just a bit to get that bottom layer starting to blend. 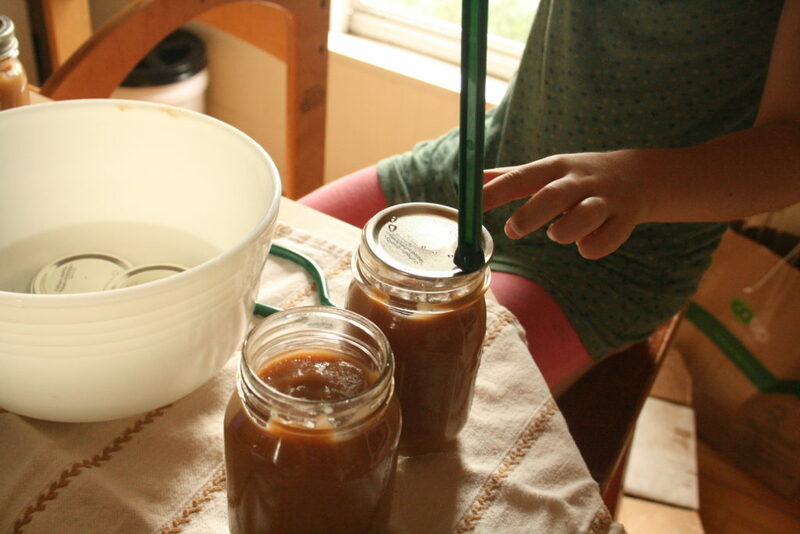 Water is often added in traditional sauce making to get the apples boiling, so safe to say you could add water if you don’t have juice, but this will increase the likelihood that you will need to add a sweetener. Start by blending at level 4. 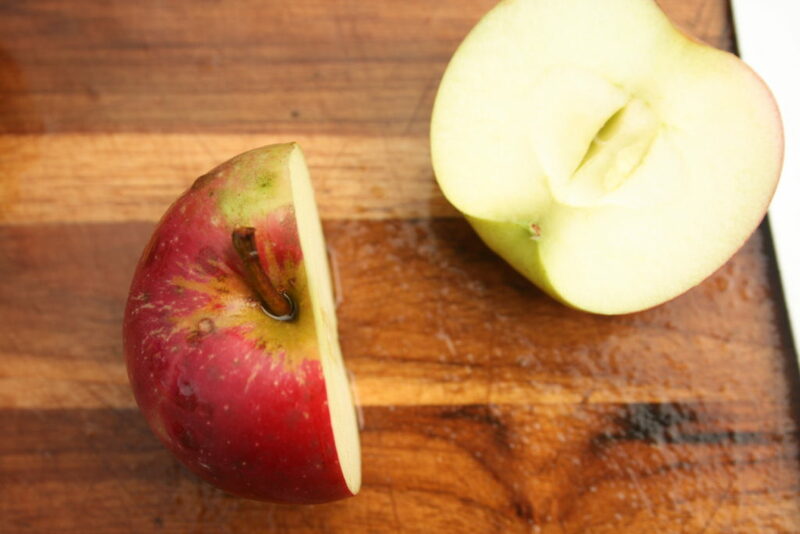 Push the apples around toward the blade with the tamper tool until they all start moving easily. At this point, turn it up to a 6 until all the peels are clearly blended up. 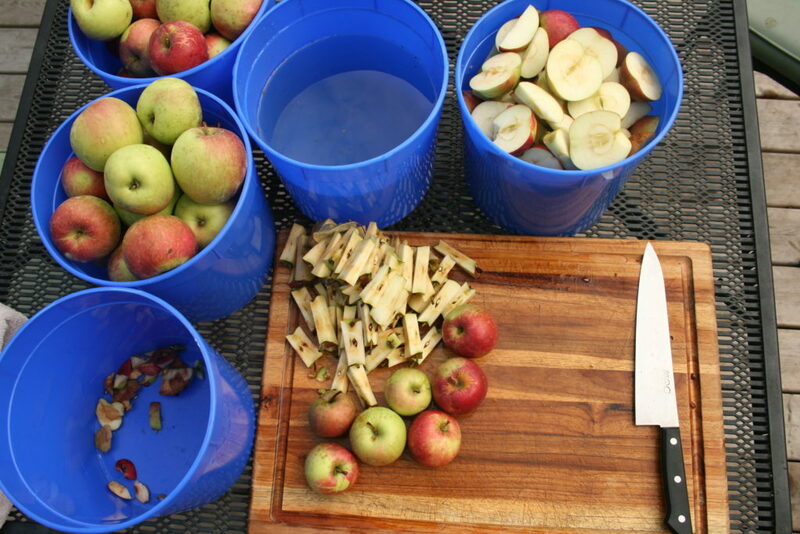 Dump the blended apples into a large soup pot, and repeat. 3. Heat your pot of blended apples. Optional: Add spices and/or sweetener to taste at this time. Tip: Do not turn the heat on and walk away. 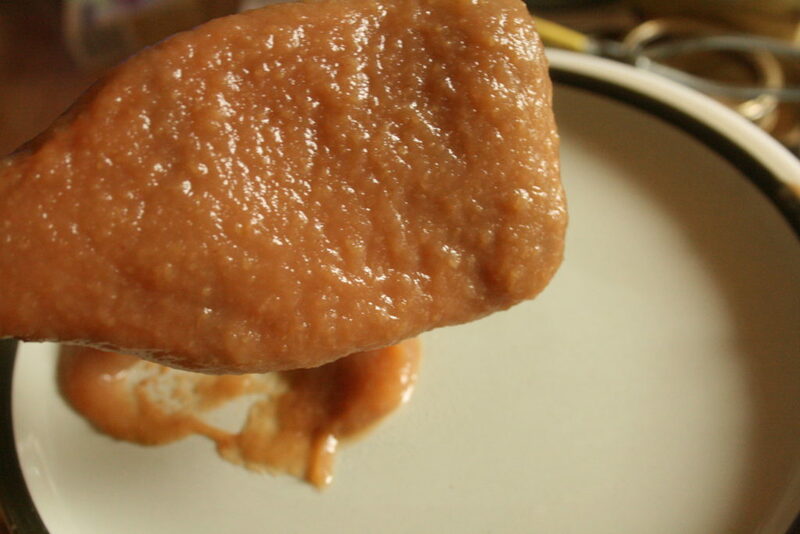 Apple sauce will cook to the bottom of your pot easily, then you will have burnt flecks in your sauce. The heat should not be too high, and you should stir with a long, flat headed utensil (in above photo) so that you can periodically scrape the sauce on the bottom and sir it in. On occasion, I find that some sauce did brown on the bottom. I am usually able to scrape it up with my utensil and just remove it from the pot. If you’re doing a lot of sauce, this process of heating takes patience. I like to leave the sauce uncovered so moisture is not trapped and watering the sauce down. Tip: Boiling hot sauce readily splatters so a splatter screen can save mess and burns if you choose not to cover the sauce. If you’d like to simmer the sauce for a while to reduce it or allow flavors to develop, you could. I find that the time it takes to bring the whole pot to a heated rumble is enough time for the flavor of raw apples to mellow and the cinnamon to come through, so I move right to the canning step. 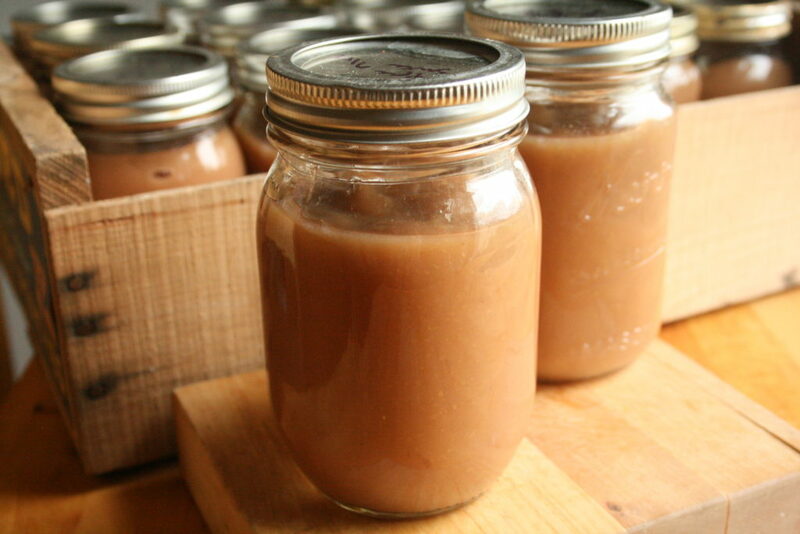 Applesauce is also a good candidate for freezing, if you prefer. 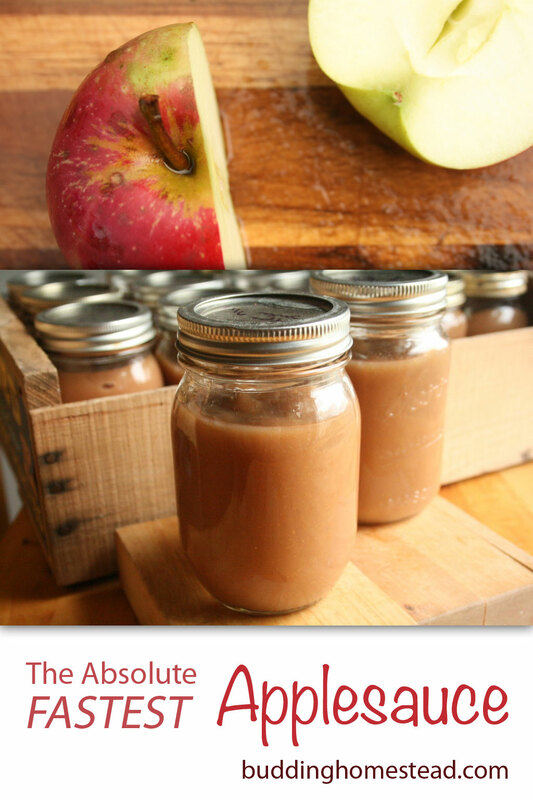 Applesauce is very easy to can – no need to add lemon juice or other acidifying agents. The most important thing is that the sauce be hot and the jars be hot and sterile. Fill jars, leaving a half inch of headspace and process for just 10 minutes! Every time we can applesauce, we eat a bowlful while it’s still warm, and I’m reminded how much more I enjoy applesauce when it’s warm. YUM! 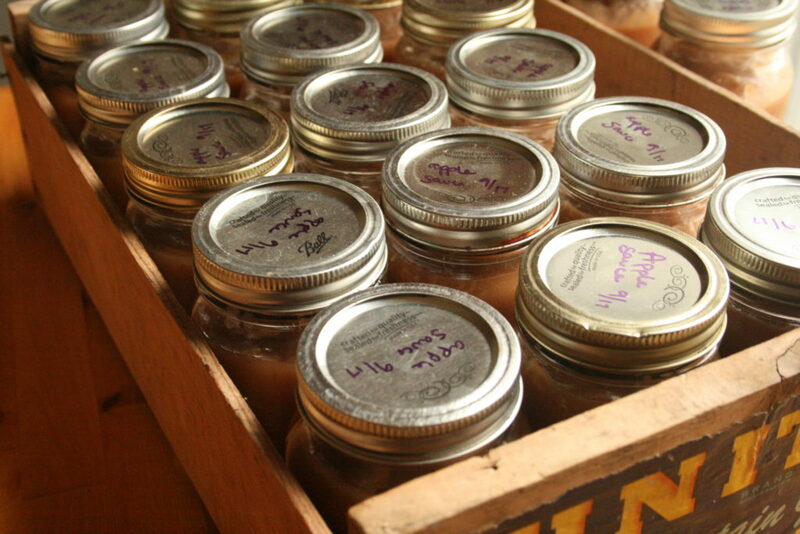 These beautiful jars of homemade goodness are a canning shelf must-have. They are super convient when I need a quick, healthy snack to serve the troops! 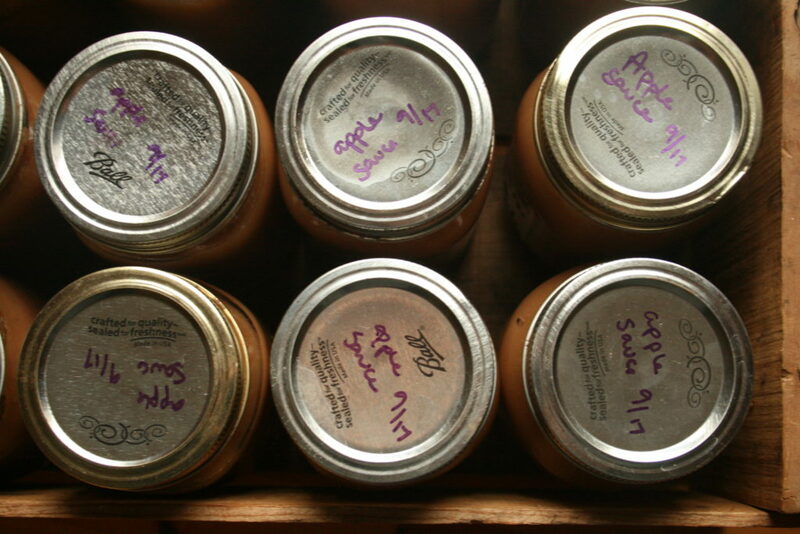 Are there any canning recipes that are a staple in your house? Or ones you’ve come across that you want to try? Please do share in the comments!